Community Health Care Nursing has become established as an essential source of reference for all those working in the primary care and community health care domain. The Fourth Edition of this successful text focuses on new emergent agendas which affect primary care and public health education and service delivery/improvement. 1. 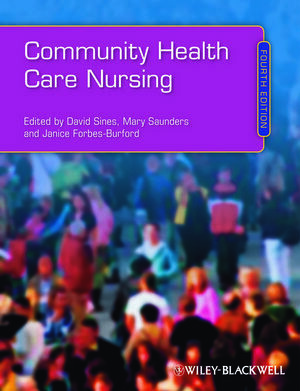 The context of Community Health Care Nursing. 2. Social Policy in Public Health & Primary Care. 3. The Origins of Contemporary Primary Healthcare. 4. Community Development in Public Health & Primary Care. 5. Health Needs Assessment, Risk Assessment and Public Health. 6. Research Perspectives Applied to Primary Health care. 7. Specialist Community Public Health Nursing- Health Visiting. 9. Contemporary Issues in District Nursing. 13. Community Mental Health Nursing. 14. Community Learning Disability Nursing. 15. Advanced Nursing Practice in the Community. 16. Inter-Professional Practice and Teamwork. 17. Measuring the Effectiveness of Community Healthcare Nursing. 19. Specialist Community Public Health Nursing. 20. Primary Care Service Provision and Commissioning. 21. Inter Professional Practice Teaching and Learning.